Thank you for volunteering to be a PTA Chair! Many chairs get their own e-mail address to use for the year and these are listed on the “contact us” page. Contact the webmaster if you need a PTA e-mail address but do not currently have one. Each e-mail comes with a Google Drive account that is shared with all the other chairs in the PTA (with the exception of Treasurer who has both a public and a private folder). To access the google drive account: Log in to gmail using your chair’s e-mail address and password (contact webmaster if you need access). Click the nine little squares next to your e-mail address in the top right corner. and then select “Drive.” All of your files should be stored in your directory. Many chairs also keep paper copies to hand off year to year. Most committees have a budget that has been approved by the PTA. Please contact the treasurer if you have questions about your committee’s budget. When spending money for your committee, please keep all receipts and fill out an expense reimbursement form (found on the PTA Forms page) to be reimbursed. This form may also be used to pay a vendor directly. Please note that as a non-profit organization, the PTA will not reimburse you for sales tax paid, and you should not have to pay sales tax on items used for PTA purposes. Most vendors and stores will honor this if you simply tell them that you are purchasing for PTA purposes. There is a sales tax exemption form on the PTA Forms page should a vendor request it. 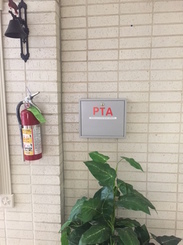 The PTA lockbox is a place where you can place items for the PTA – checks, cash, and other items. If you’re wondering where the PTA lockbox is located, please see the photo to the left. It is in the front foyer area near the new display case.